From the Master Yarn Chart. Comparing three very different pearl cotton yarns, with very different recommended weaving sett for each, represented by the three comma-separated numbers. How were the setts for the Master Yarn Chart determined? For instance, the sett for 10/2 pearl cotton is 20, 24, 28. Why these numbers and not 14, 16, 18, or 30, 32, 34? Have these worked best for a large number of weavers over time or is it a practical reason to do with how to warp a loom (can only fit so many threads in a particular reed or need a certain number of threads to fill the reed without gaps)? The middle number of the three given for each yarn is the sett that produces a balanced, medium-density plain weave in that yarn (24 ends per inch for 10/2 pearl cotton). It is the same number that you’d get if you wrapped a half inch of a ruler with that yarn without over-crowding the strands. The three numbers have nothing to do with the reed you choose (most reeds, whether 8, 10, or 12, can be sleyed to get the density per inch you need). The other two numbers are a bit more arbitrary; I don’t pay too much attention to them when deciding how to warp a loom. In theory, they show the range between setting the yarn farther apart (the lower number) if you want a really lacy plain weave or closer together (the higher number) for a twill (with floats) to get a balanced twill. But the sett you’d really want for these situations would depend on desired fabric hand and/or the specific twill. The reason the numbers for 10/2 cotton aren’t 14, 16, 18 is that those numbers would produce a very very very loose plain weave, and the reason they aren’t 30, 32, 34 is because you probably couldn’t even achieve a balanced plain weave with those numbers, no matter how hard you beat the weft. Posted February 1, 2012. Updated July 7, 2017. If you have a weaving question we would love to hear from you! Please email Madelyn! 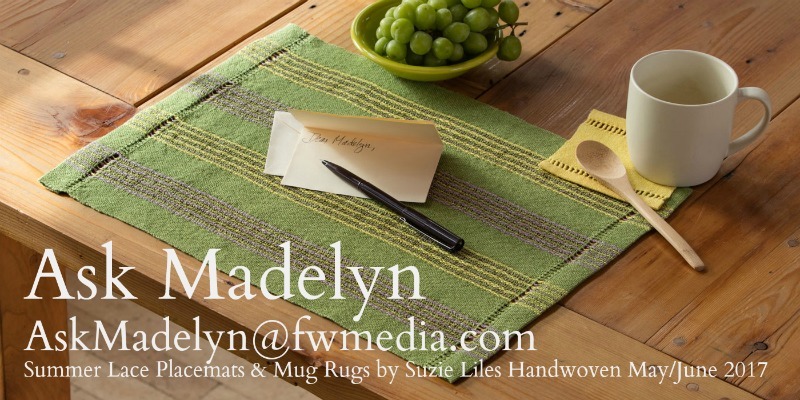 Pictured above: Summer Lace Placemats and Mug Rugs by Suzie Liles Handwoven May/June 2017. View related & recent “Ask Madelyn” posts!